Breakstone’s Small Curd Cottage Cheese - Enjoy a healthy and filling snack with Breakstone’s Small Curd Cottage Cheese. 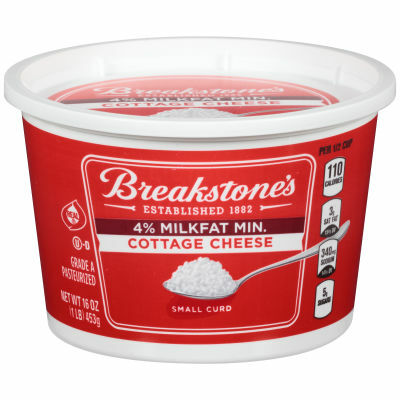 This cottage cheese contains only 110 calories per serving and is made with 4% milk fat. With 11 grams of protein per serving, you can count on this snack to satisfy your hunger. Rich and Creamy - Treat yourself to the creamy taste of cottage cheese any time of day. Enjoy it on its own or as a creamy low-calorie addition to your pasta or casserole dishes. Serving size 1/2 cup (117g).